The word “fee” is not a curse word, but it should be. 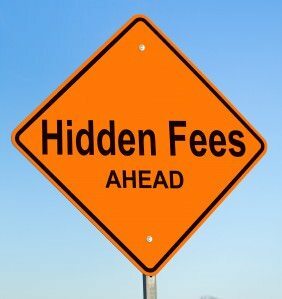 Many companies have made it a habit to charge small hidden fees here and there and over time these fees add up. Over the course of a year people pay hundreds of dollars in assorted fees from different companies. You can avoid a lot of them if you do your research. Having a credit card is something that many people view as a rite of passage. The average person has three of them and many are unaware of all of the hidden fees involved with having a credit card. Some cards charge monthly or yearly fees for membership, cash advances fees, late fees and a host of other fees. It is up to you to understand what a company charges before you sign on the dotted line. People get bank accounts all of the time without thinking about all of the hidden fees that may be incurred from having an account. There are returned check fees, insufficient funds fees, monthly fees with some accounts and overdraft fees. There are even certain accounts that charge a fee if you do not maintain a certain minimum balance. If you go to an investment management company about helping you invest some money, keep in mind that many of them charge very large hidden fees for their services. Shop around before deciding with company to work with. There are many hidden fees that are involved when it comes to going to school. There is of course tuition, but there are also fees for applications, books, repeating semesters and many other things. Always research what fees are charged for everything before you sign up anywhere. When you pay your utilities a lot of what you pay are fees that are tacked on. There are charges just for having a line, regulatory fees, late charges and many other things. Cable companies in particular tend to charge fees that are sometime equal to 25% or more of your actual service charges. When you sign up to get a cell phone you do it for the convenience and necessity, but you have to keep in mind that those deals that you think are so great are not always. Many cell phone carriers charge fees for calling customer service as opposed to dealing with things online. There are also many fees charged for things like calling 411, overage minutes and changing your telephone number, Make sure you understand everything you will be charged before you sign up for any new service. You should be pretty aware of the fact that almost any company you are going to do business with will find a way to charge you extra. A lot of times this leads to you paying much more for services than you originally anticipated. Make sure that you do your research on any company you plan on working with and always read the fine print so that you know all there is to know about each company before you sign up for anything.